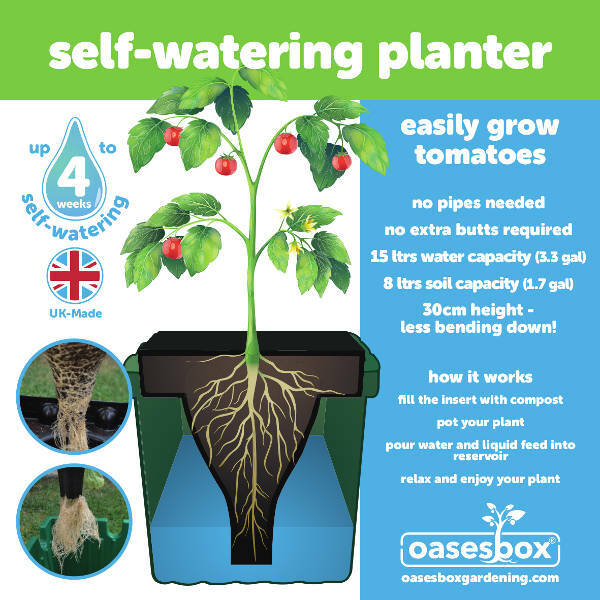 The Oasesbox is ideal for growing tomatoes and is probably the best Self Watering Planter (SWP), on the market. It is also very good for growing chilies, aubergines and cucumbers and other vegetables and herbs too, where high quality is required. The Oasesbox is a reservoir container with a cone insert in which a plant grows. When the reservoir is filled with water and nutrients, a plant is able to take up water and nutrients whenever needed. See Coupon Code Below for Discount! One of the biggest problems with growing tomatoes, is that when the soil dries out, plants are unable to take up nutrients. This results in Blossom End Rot and other problems associated with nutrient deficiency and stress. This is avoided with the Oasesbox because water and nutrients are available 24/7. Now made with 100% recycled plastic! You don’t need to water everyday but your plants still receive all the water and nutrients they require 24/7. Because plants are always kept happy with water and feed, they won’t become stressed and fall victim to disease and nutrient deficiencies. That means healthier plants, producing better quality and a greater yield of tomatoes. One of the most helpful benefits is that you can go on holiday and know that your plants are still watered and fed. 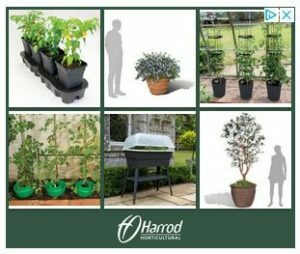 Water and nutrients supplied 24/7 means less Blossom End Rot, less fruit cracking and splitting and a more consistent size of tomatoes to name just three benefits. Three Oasesbox units slotted together. It is a very sturdy item that will last many seasons. 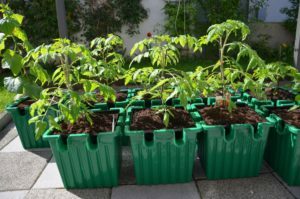 It can be turned into a grow bag extension by placing a grow bag onto three Oases boxes slotted together. The clever design ensures that soil does not end up in the reservoir but roots are able to grow out of the bottom of the cone and into the reservoir. It is very easy to clean and maintain – no capillary matting to change each season. The Oasesbox comes in three different colours with the choice of purchasing one or three units. The Oasesbox unpacked in green – black and terracotta available. The Oasesbox is very easy to set up. 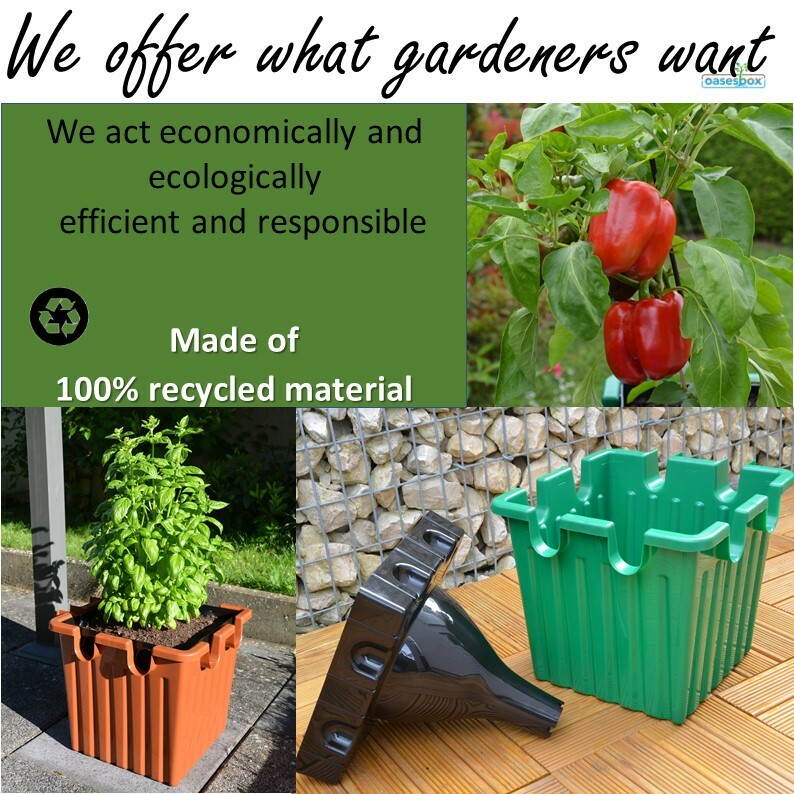 It is more sturdy and stable than the Quadgrow Planter. Single units can be used or several slotted together in a straight, square or corner shape. No capillary matting is needed. It is easier to water the Oasesbox reservoir. 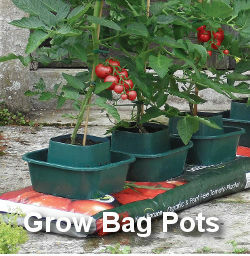 If a greater volume of soil is required, a grow bag may be placed on top of the Oasesbox which is used as an extension but is not required for normal use. A root disease cannot spread from plant to plant because each reservoir is self contained. The Oasesbox is slightly more expensive than the Quadgrow Planter. The Quadgrow Planter has room for four plants. It is very easy to set up – put soil in the cone, water in the reservoir and off you go!. It is a very sturdy item. There is no need for capillary matting which can struggle to take up enough water on a very hot day. The roots sit in a cone that is slotted down into the reservoir so it is very reliable. Roots are able to grow into the reservoir – important in high temperatures. There is the option of three different colours. If you are interested in the Oasesbox, use the coupon code: TOMGROW-5 for a 5% discount. If you email me after purchase, I will also send you a PDF document called “Nick’s Tips On Getting Started With The Oasesbox” full of suggestions on how to get the maximum results!